When the smoke clears, you’ll be the last rider standing. The KTM 250 XC-W TPI is one of the best pound-for-pound fighters in the world of Enduro, pummeling its more complex 4-stroke rivals. All muscle, no fat: this groundbreaking, fuel-injected 2-stroke machine is as lean as it is powerful. FRAME: The high-tech, lightweight chrome-moly steel frame has a knack for easy handling, outlandish rideability, precise cornering and excellent stability. You can also count on high torsional rigidity and low longitudinal stiffness. This results in better absorption of the energy created from the front and rear suspension sucking up jumps and bumps. In short: more comfort and less rider fatigue. Laterally attached, lightweight engine head stays (the connection between cylinder head and frame) contribute to a reduced vibration level. Two threaded inserts in the lower cradle tubes allow for safe fixation of an optional skid plate. The engineers could pull off all of this while making the frame 2.2 pounds lighter than that of the lightest competitor on the market. In addition, it is easier to maintain, easier to work on and supplies more space for the tank and other components. On the XC-W TPI models the upper frame tube features a slot where the oil filler cap is mounted, which feeds the oil tank via a hose inside the frame tube. The bike also features an extra-light subframe made of high quality aluminum, which tip the scales at less than 2 pounds. FRONT SUSPENSION: The WP XPlor 48 upside-down fork is a split fork developed by WP in close collaboration with KTM. It is fitted with a spring on both sides, but features separated functions for each fork leg: compression damping is fitted on the left side, while rebound is on the right. So the fork can easily be adjusted for compression and rebound with the twist of a dial on top of the fork tubes (30 clicks each). In addition, a sealed hydro-stop guarantees better resistance to bottoming-out. Due to high-quality materials and a state-of-the-art production process, the WP XPlor 48 fork – with approx. 300 mm of travel – has outstanding response and damping characteristics. An optional preload adjuster allows for a threefold spring preload setting without any tools. Easy as one, two, three. TRIPLE CLAMP: The 250 XC-W TPI is fitted with forged triple clamps with an offset of 22mm, ensuring a solid grip of the fork and precise handling. The handlebar is adjustable forwards and backwards over 4 positions; this XC-W will fit you like your favorite gloves. BRAKES: You couldn’t brake any harder, better, faster or stronger. These high-tech Brembo brakes are combined with lightweight Wave brake discs and are the ultimate solution in braking technology. First you outrun them, then you outbrake them. POWER: The KTM 250 cc engine is known to be the most powerful and most competitive 2-stroke engine of the class. And things get even better. The KTM 250 XC-W TPI is fitted with a transfer port injection fuel injection system, a unique feature when it comes to sporty 2-stroke race bikes. The patented EFI system with two injectors mounted on the transfer ports of the cylinder makes the engine much smoother to ride and reduces the fuel consumption drastically, a global game changer in terms of technology. On top of that, the KTM 250 cc powerhouse features a modern shaft arrangement that’s beneficial in terms of mass centralization, a well-protected E-starter, a balancer shaft for low engine vibrations, a 6-speed Enduro transmission and a hydraulically operated DDS clutch. This is a song of belly tingling 2-stroke symphony when keeping it pinned on the pipe, while still being able to deliver ultra-smooth and reliable drive when you need it. CYLINDER: The KTM 250 XC-W TPI cylinder has a bore of 66.4 mm and is fitted with the sophisticated power valve providing smooth and controllable power characteristics. For the EFI application the cylinder features two lateral domes, which hold the fuel injectors supplying fuel into the rear transfer ports. Thus the loss of unburnt fuel is reduced for fewer emissions, a more efficient combustion and low fuel consumption. A tube in the back of the cylinder is connected with an intake pressure sensor, which supplies pressure data to the control unit. 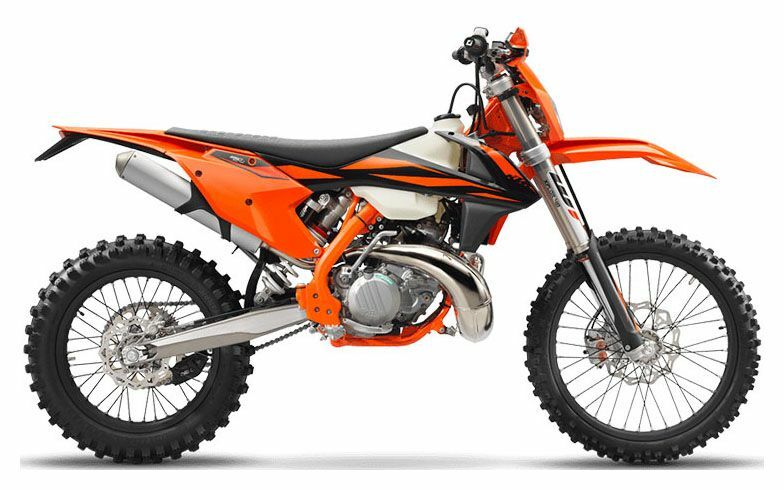 CLUTCH: The KTM 250 XC-W TPI employs the KTM-developed DDS clutch (damped diaphragm steel) with a wear-free steel basket, extremely heat resistant clutch plates and nitrated steel liners. This clever design employs a diaphragm spring instead of the usual coil springs, making for considerably easier clutch action. A diaphragm spring also leaves sufficient space for a damping system to be integrated into the clutch hub. The goal is traction, but durability is as well. Light operation and telepathic amounts of control are standard with this hydraulic Brembo actuated clutch. COOLING: KTM’s proven cooling system routes the coolant from the cylinder head through the frame triangle, directly to aluminum radiators made by WP. The additional KTM PowerParts radiator fan is regulated by the EMS control unit for easy installation. Thanks to flow optimized internal circulation and CFD-calculated ventilation, the system is superbly efficient. In addition the radiator protectors improve heat dissipation. Especially in the mud. They are also integrated into the front part of the shrouds to protect the radiators in a crash. EXHAUST: This nickel-plated pipe is produced by WP Performance Systems. It is designed for an optimal power band and maximal performance of the engine. A modern 3D production process guarantees top precision and reliability of the pipe, so this screamer is as tough as it is strong. HANDLEBAR: KTM engineers sure know how to handle handlebars. This tapered unit, made of high-strength aluminum by NEKEN, features a throttle assembly with a twin-cable for TPI models just like their 4-stroke brothers with a double-cable aluminum body and straightforward free-play adjustment. A volcanized grip sits on the right, while on the left side of the bar a comfortable ODI lock-on grip is mounted, which does not require any wire or glue to be fixed.